Our services are designed to the refugees' cultural background and are provided in their mother tongue. 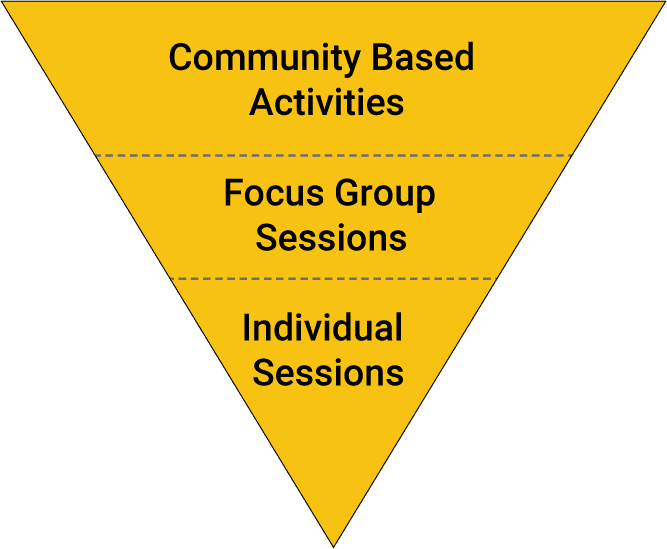 Our implementation of MHPSS is based on our unique three level method, "the inverted pyramid", which focuses on community-based activities, focus group sessions, and individual sessions for vulnerable cases. Based on our belief of sharing professional knowledge and field experience, Humanity Crew conducts expert trainings and cultural mediation workshops to mental health professionals, humanitarian aid workers, volunteers, and refugees. Our trainings cover a wide range of topics relevant to refugee mental health and integration, and emphasize gender, cultural, and lingual sensitivity. Our research department conducts field and clinical research concerning the mental health of refugees, and shares published reports in academic journals, at international conferences, and with the media. Our aim is to increase knowledge in the field of refugee mental health, thereby, bringing the world one step closer to making mental health support a fundamental component in all emergency efforts. The Online Clinic is a network of mental health professionals that provide online support to displaced populations around the world via Tele-Therapy. The Online Clinic was designed for vulnerable cases who are in geographically hard to reach places, but who are in continuous need of MHPSS support. We currently provide this service for refugees who were previously supported by Humanity Crew, and that are now relocated to other camps, centers, or countries that cannot be physically reached by our therapists.